Those early spring days in the bee yard often bring surprises, turning the apiary into a top-notch outdoor classroom. If the beekeeper is observant and willing to follow clues left by the bees, it would be a rare season indeed that leaves the beekeeper without a new lesson. The following is a review of what took place in one of my hives this spring. During the first few days of May, the open air classroom was assembled, I stood before the blackboard, (yes, I’m dating myself, but for the rest of you just think PowerPoint!) and the beekeepers in attendance were given a puzzle to resolve. On May 2nd, I removed a queen and five frames of brood and stores to create an artificial swarm. I was making a split from a colony that had wintered strongly and had already filled three boxes with bees. Upon opening the hive I was surprised to find the queen roaming around with no attendants on the capped honey contained on the first frame, which I had pulled from the very outside edge of the hive box. It struck me as strange but what the heck – it was an easy find. I was out to create a split and the queen seemed to want to cooperate! Queens can be found anywhere in a hive, but it’s rare to find them spending much time atop capped honey. Only later did this begin to add up. I “notched” numerous cells containing eggs, and returned 5 days later to remove the capped queen cells. Notching is the procedure of breaking down the bottom edge of a cell which contains an egg without damaging the egg. This allows the bees to immediately begin building a queen cell and all but guarantees multiple queen cells will be built. It takes 8 days for a queen cell to be capped. 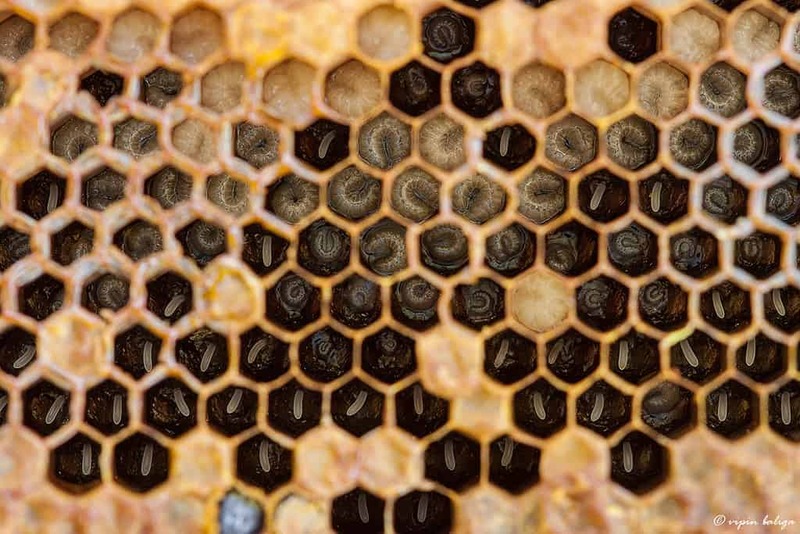 Queen cells capped prior to that have been raised from larva that has not always received the appropriate amount of royal jelly and can result in a weaker queen. To my surprise the colony had produced very few queen cells, just four as matter of fact. All of them were capped. No queen cells had been produced from eggs. I added one more strange event to the equation. Upon discovering there were only a few queen cells – and queen cells made only from older larva at that – I knew something different was taking place. It would require a little more detective work but I was determined to get to the bottom of the mystery and set out to solve it. I continued my search of the original hive and upon further inspection I found eggs but no larva (remember the queen had been removed). Yet there were these four queen cells. What was up with that? Someone was laying and it wasn’t a laying worker. Laying workers tend to lay eggs on the side of a cell because their abdomens are shorter than a queen and don’t reach the bottom of a cell. Further, lying workers will normally lay multiple eggs in one cell. Here’s an image of a well-developed brood frame. A close look will show various stages, from egg to young larvae to more developed larvae. The different sizes of the larvae is quite evident, based on their age. Beyond the cells shown would be capped cells. Immediately I walked to the other side of the apiary to check the hive that housed the split I’d made from this colony a few days earlier. Could the queen have left her new home and flown back? It was unlikely but I had to know. The split was just five frames and it only took me a couple minutes to locate the queen. Clearly she was not the one laying eggs in the original colony and now I felt I was beginning to get a handle on what may have taken place. Pulling my thoughts together, I walked back across the bee yard and returned to the open hive. I’d had the hive open for a while now and after removing the top box I proceeded deep into the second box in search of the queen. Still, the bees remained calm. These bees had always been easy to work and an attentive ear could perceive only the slightest increase in “buzz” volume. However, any colony open as long as I’d had this one open should have been raising the volume, especially a queenless colony. It was one more clue quietly proclaiming there was queen in the hive. I soon found more eggs, nearly two frames of eggs. There was now no doubt the colony had a queen. After carefully reassembling the hive I retreated to the comfort of a shady bench I keep in the bee yard. from which I watch and enjoy my bees. Retrieving the notebook I always carry in my kit, I began to lay out a timeline of events and with it my thoughts about what had occurred. Below is a summary of my thoughts and the concurrent events. Walk through the steps and see if you agree with the assessment. I removed the queen and some brood to make a split (an artificial swarm) and prepared the hive to raise its own queen by notching. Upon returning to the hive 5 days later, just four queen cells had been made and they were capped, meaning older larva had been used to make them. Then all queen cell production ceased. I concluded the colony initially felt it needed a queen after I removed the queen when making my split. That would explain how the colony prepared some queen cells from older larva, but stopped short of building new queen cells beginning from eggs. My inspection of the hive revealed a number of eggs, but no larva. Clearly a queen was lying but had not been doing so for very long. It became apparent the queen I removed had already been replaced but most likely had not completed her mating flights. If you will recall, the queen I removed was found on an outside frame of honey at the top of the hive. I believe she had moved as far away from the new queen as possible and that is why I had found her in such an unlikely place. Though I have no proof, I believe the new queen completed her breeding flights almost immediately after I removed the first queen. After breeding, her pheromone level came fully up to speed and that stopped the construction of additional queen cells. A few days later she was laying the eggs I found. Most the literature says that up to 20 percent of spring hives contain two queens as they prepare to swarm or replace the old queen via supercedure. I have since concluded my colony would have swarmed because the queen I initially removed to create a new colony has an excellent brood pattern and is laying an abundance of eggs. She is clearly healthy. It took me a bit to put all the pieces together, but after following the trail of evidence, as unlikely as it was, I came to understand that my hive had two queens in it on the day I removed the first queen to make a split. New queens are difficult to distinguish from regular worker bees prior to breeding and can easily be overlooked when examining a frame. They do not grow into the large queen size bodies we are familiar with until after breeding. I have since wondered what would have happened if the new queen had been on one of the frames I removed to create the split. I’m sure the original hive would have requeened itself from four of the queen cells I’d found, but what would the split have done with two queens in it? The literature says the older queen would eventually have been killed or forced from the hive, after the young queen completed her breeding flights and matured. But would it have possibly swarmed? That’s a question for another day. For the beginners and especially the second year beekeepers (because it’s the second winter that gets so many beginners hives) out there, I’d like to point out how more happens in the bee yard in spring than at any other time of year. Yet, many beginning beekeepers never get to experience this season because they have not been able to keep their bees alive through the winter season. In the coming weeks I will address how to prepare your colony for winter in the hope that next spring you will be able to experience the spring season with your bees. In the mean time be sure to take a mite count or two. It’s a key part of preparing your colony for winter.